The question, “who owns social?” has become a toxic, internal struggle between the Marketing and Communications teams within many companies (and expands to include IT, Customer Service, Human Resources, and Sales). The answer is that they all own social, collectively, but most companies have yet to align their divisions and teams to work in coordination. This leaves companies solving for social through a framework built for an analog era. Why? 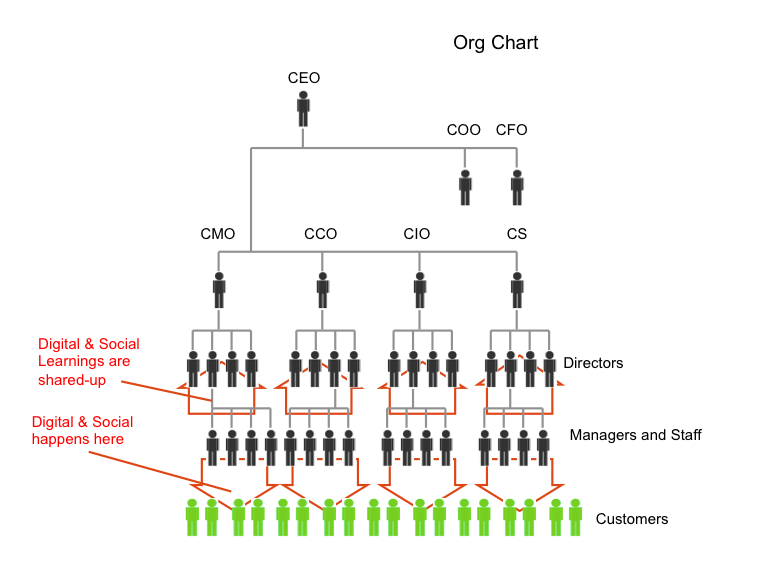 Social has typically become part of an organization via a bottom-up adoption through the work of small teams in the trenches (many companies hired interns/junior level staff to manage their social programs). This causes each separate team to develop its own specific take on social. This leads to a handful of internal teams who strongly believe they each have the best answer for social. These different social answers eventually work their way up ranks to where the division leads (Marketing, Comms, IT, etc.) need to reconcile the different approaches. They then negotiate and navigate. What needs to happen instead is collaboration and realignment. Companies need to create a new way to manage social across all teams, switching from separate bottom-up learnings to a more holistic cascade approach. 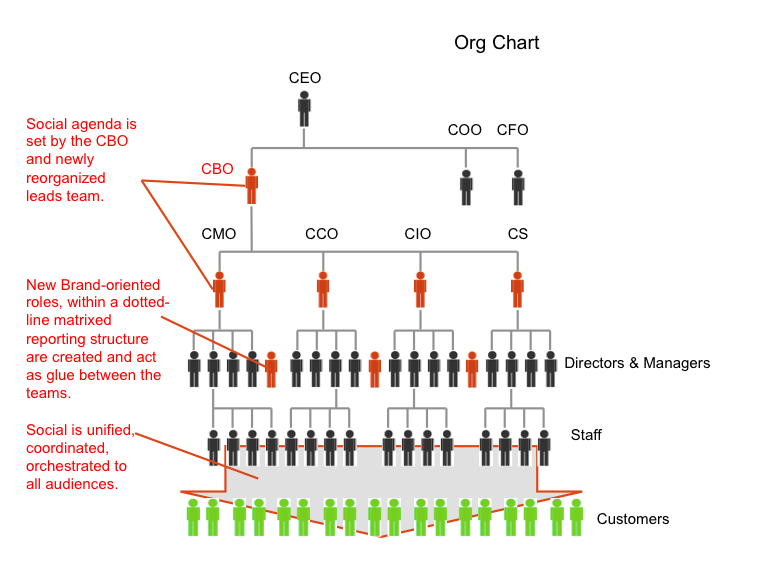 What is needed is the creation of a new layer for the organization between the CEO and the current leads. It’s the creation of a new C-level position and a redefining of the leads’ job profiles. This will not happen overnight, but it is the direction companies must be shifting towards. This position that is needed to solve this problem is the Chief Brand Officer (CBO). The CBO will invent the shared, holistic social “north star” as part of their new duty to own, cultivate and shepherd the Brand through all channels (Marketing, Comms, IT, Customer Service, etc.). The immediate task for the CBO is to align these leads and their teams under the umbrella of Brand and sync their activities to map to the goals set by the CEO. The CBO will create the new framework for social, ensuring it cascades while keeping the grass roots nuances that are relevant and actionable for the individual teams. These teams will now work in orchestration, under the guidance of the CBO. The CBO will pivot these teams from parallel “partners” to become “collaborators,“ enabling the organization to map to the new opportunities of the social era. Say hello to the new era, the era of the Chief Brand Officer.